Flex-a-Lite Radiator Hose Adapter UNIVERSAL - MiataRoadster - Stay tuned with MiataRoadster! 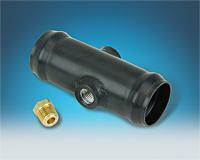 Flex-a-Lite Radiator Hose Adapters provide a threaded fitting for screw-in temperature sensors. Features 2ea. 1/4” NPT threaded ports, plus 1/4” brass plug. Fits 1-1/2” I.D. radiator hose.